Free Printable Singular and Plural Matching. Free Printable Singular and Plural Matching Worksheets, a good singular and plural activity for your students at English classroom. 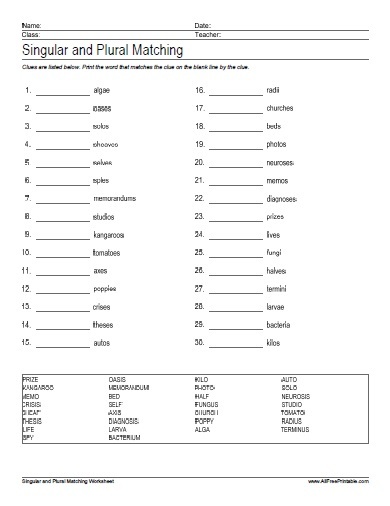 Print the Singular and Plural Matching free using your home laser or inkjet printer and use it as a quiz, test or practice test at school or homeschooling. The Singular and Plural Matching includes 30 numbered lines with a clue word bank. We have 3 Singular and Plural Matching Worksheets to select from. Just match the singular word with the plural word. Click the link below to download or print the Singular and Plural Matching Worksheets now in PDF format.